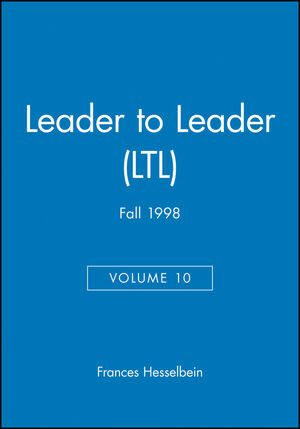 Get insightful articles on leadership, management, and strategy written by today's leaders with this award-winning journal. Brought to you by the Frances Hesselbein Leadership Institute, Leader to Leader brings together a peerless selection of world-class executives, best-selling management authors, top consultants, and respected social thinkers. Leader to Leader poses provocative questions that challenge your leadership assumptions and provides compelling evidence powerful enough to change your leadership thinking while offering thoughtful analysis of complex leadership issues. Frances Hesselbein is the President and CEO of the Frances Hesselbein Leadership Institute and its Founding President. Prior to founding the Frances Hesselbein Leadership Institute, Hesselbein served as the CEO for the Girl Scouts of the USA. She is an expert in the field of leadership development and has been awarded the Presidential Medal of Freedom. An award-winning journal of the Frances Hesselbein Leadership Institute, Leader to Leader, brings together a peerless selection of world-class executives, best-selling management authors, top consultants, and respected social thinkers. Leader to Leader poses provocative questions that challenge leadership assumptions and provides compelling evidence powerful enough to change leadership thinking.